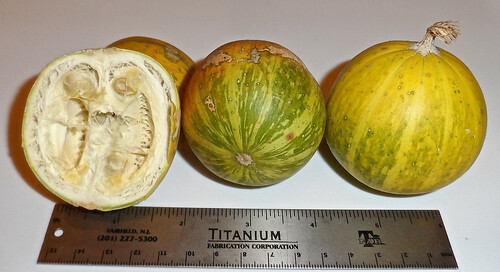 Dangers: flesh of the gourd is extremely bitter and can be poisonous in large doses due to saponins. 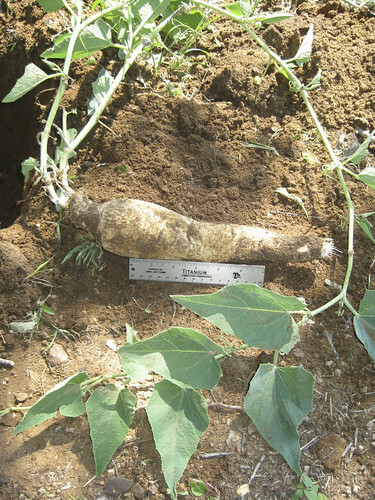 Buffalo Gourd plant when young. Nose and eye find this plant at nearly the same time. 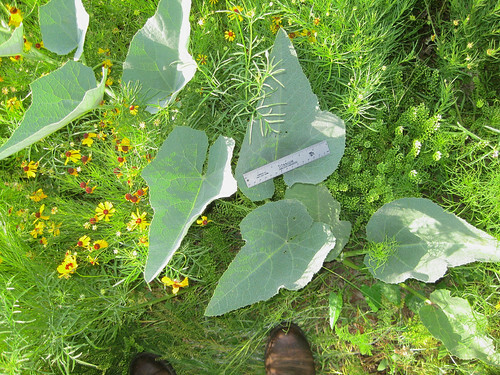 The large, heart-shaped leaves and yellow, 5-petaled flowers of Buffalo Gourd give off an unpleasant smell which reminds me of nasty gym socks. Starting in mid-summer the fruit appear. Looking first like small, round watermelons these fruit eventually turn more yellow as they mature but never grow bigger than a baseball. 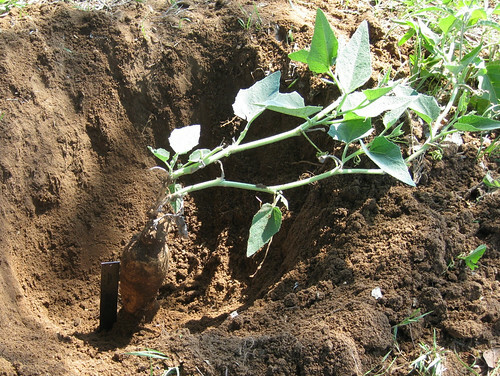 Buffalo Gourd vines can stretch many yards from a central taproot and the beings perennials, show up in the same spot year after year. 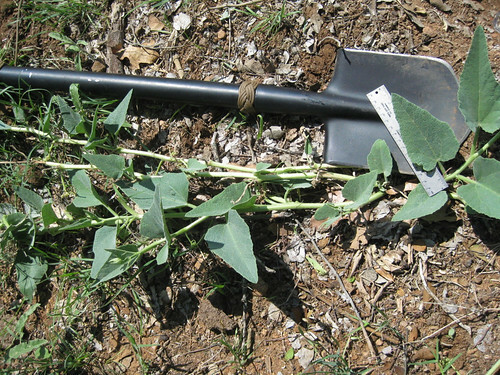 It's large taproot makes the plant very drought resistant and it grows best in the drier areas of Texas, especially in the Hill country and westward. The flowers, similar to squash blossom, can be eaten both raw and fried. They do have a bad odor and are somewhat bitter when raw. Buffalo gourd seeds were a staple food of early Texas Native Americans. The seeds must be completely cleaned of any gourd flesh or else they will be extremely bitter. Once completely cleaned they can be boiled and mashed into a porridge or roasted like pumpkin seeds and have a similar flavor. These seeds do contain a large amount of calories in the form of oil (25-42%) as well as a significant concentration of protein (22-35%). The large taproot of Buffalo Gourds were to be strong medicine by Native Americans. These roots were used internally as a tea and also externally in poultices. Due to the high concentration of saponins and other potent chemicals healing with this root should only be tried under the direction of a trained herbalist! 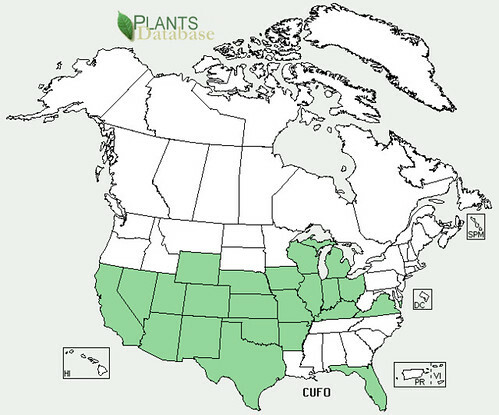 Saponins are found in both the plant's root and in the skin of the gourds and are capable of producing a lather when vigorously combined with water. Because of this they were used as a soap substitute.